It's a new month, so it's time for another Top Trend Series post! 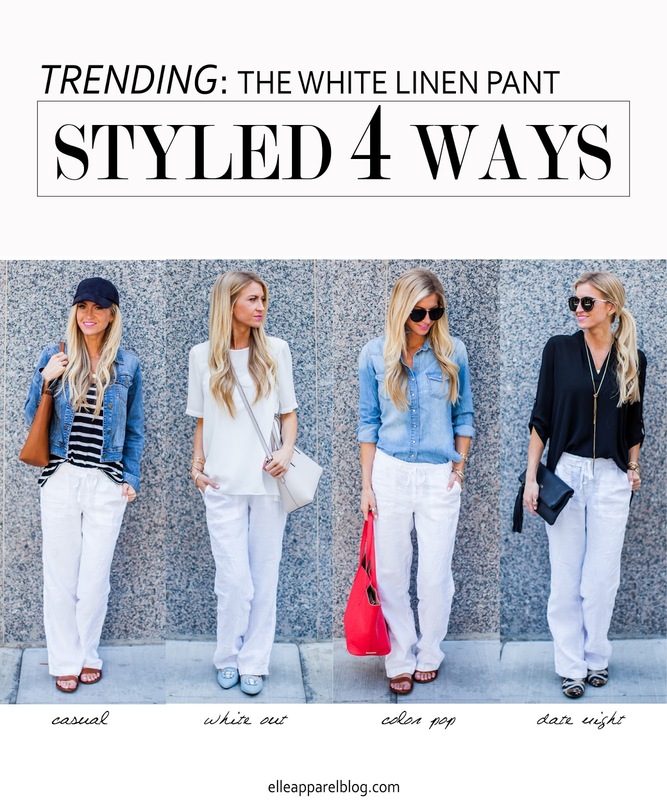 This month the must have item I am loving is white linen pants. Wide leg pants are super popular right now, but I just can't jump on the wide leg jean cropped pants. But, I have been wanting a pair of white linen pants for over a year, and these ones from Nordstrom are the perfect pants to work the wide leg trend. I posted this pair a few weeks ago over on my instagram. White pants are super versatile already, but the lightweight linen fabric screams summer vacation. A big bonus about these pants is that they are really comfy! I love this pair, and I think they are a great price. These ones run big (I got an x-small), so just be aware. The wide legs can be a little tricky to style proportionately, so I've broken down each of the four looks below and why they work. (If you haven't seen my other The Top Trend Series posts, I styled a bomber jacket, a t-shirt dress, and a pencil skirt so far in this series). A classic black and white striped tee is always a good choice with white pants. Since this top is oversized, I tucked just the front of the top in a bit to define the waist, and I layered it with a basic jean jacket to pull it in a bit. I'm such a sucker for baseball caps, and I think this casual black one balances out the casual linen pants. White on white is one of my most favorite looks to wear this season. It's so crisp and clean. For this look I opted not to tuck in my top because the blouse is a nicer drapey fabric, and it hangs beautifully when left untucked. The pants are a casual linen, but I like the juxtaposition of the casual linen next to the nicer blouse. I added my slightly off white Kate Spade crossbody bag and pale blue flats to keep with the light theme, but to add some slight shade contrasts. This look might be my very favorite. I wasn't going to tuck in my chambray top, but I think it adds just the right amount of structure when it's tucked into the pants. Untucked looked a bit too sloppy for me. I loosely rolled the sleeves and popped the collar just a bit too. 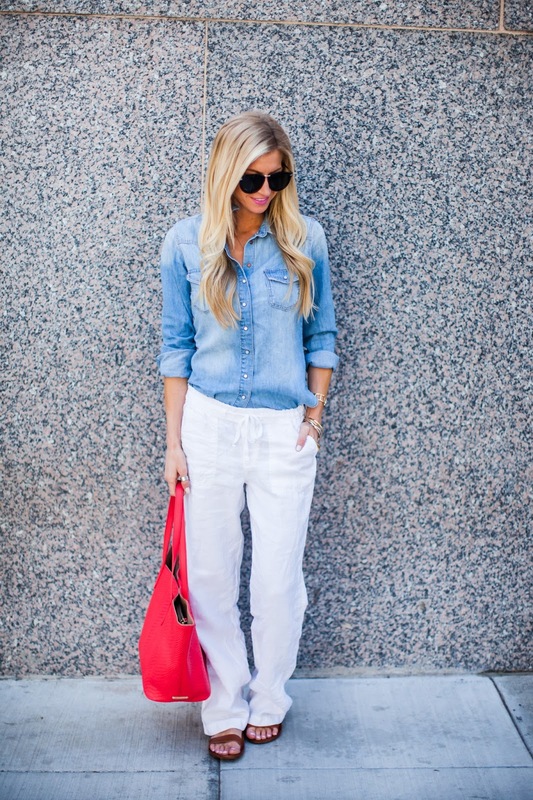 White and light blue with a pop of bright coral red is one of my favorite color combinations! For this look I picked a drapey blouse as well, but because it's so long I needed to tuck in the front. The back is super long but I like the look of it long and untucked. A long necklace mimics the length of the top and makes the pairing look intentional. I added some cute patterned flats and a dressy clutch to make these pants date night ready. These pants are lightweight so they would be great for throwing in your suitcase for a sunny vacation! I think they would also be an easy cute swim coverup option. 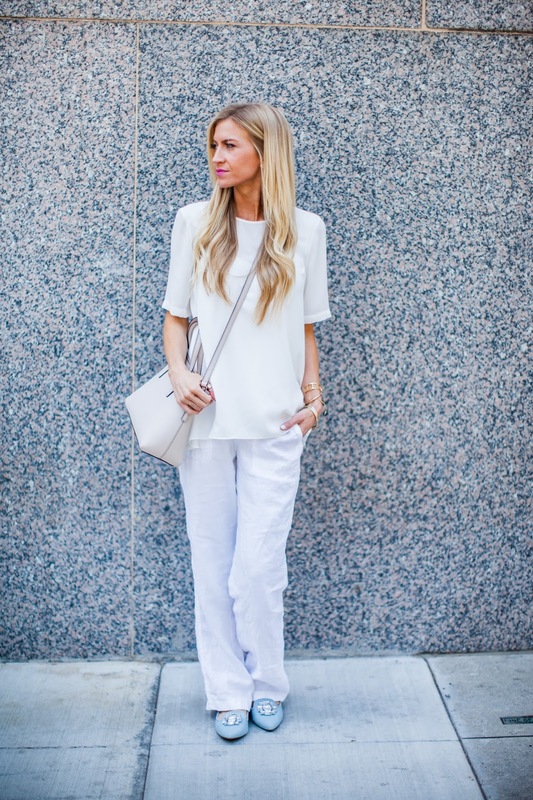 Nordstrom has a few other really cute white linen pant options that I've linked to below..